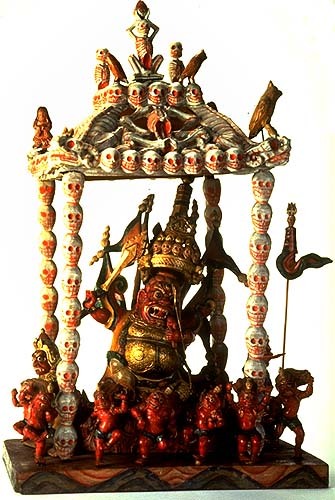 This fantastic creation showing Begtse and his retinue inside a skeleton shrine is the work of Suren, a famous sculptor of the early twentieth century. The fierce protector of Mongolia brandishes his flaming copper sword with a scorpion tail, while his left hand, armed with a bow and arrow, lifts the heart of an enemy of religion to his mouth. He steps on the corpses of a man and a horse, above the lotus, which is inserted into his copper mountain abode. The mountain in turn rises above the sea of blood enclosed by peaks painted on the rectangular pedestal. His tall crown almost equals him in height. Shaped like a tiered cake, the golden base supports five grinning skulls, a sword emblem with flaming gems, and a tall canopy surmounted by a jewel. Begtse is adorned with three standards and four flags. These flags are also the attributes of military gods such as Pehar and are part of the regalia of the Oracle of Nechung, the official oracle of the Dalai Lama. Generals in Chinese operas wear such flags as well. Begtse is accompanied by the Red Master of Life on his wolf and his sister Rikpay Lhamo, riding a lion who crouches above a prostrate man. (1) Dancing around them are the eight acolytes (one missing), red in color, with flaming hair ornamented by a single skull. They are the tritok shenpa gye, "the eight butchers who wield swords," who devour the flesh, blood, and the "life-breath" of enemies. (2) They are leaping, jumping, and running with great vigor, while wearing fierce scowls on their faces. Four pillars, each stacked with nine skulls, support a canopy ingeniously put together with skeletons of human and makaras. A seated skeleton holding aloft a human heart (Begtse's attribute) surmounts the square top, together with two legless skeletons and owls. Two larger owls (one missing) and women wrapped in flayed human skins guard the four cornices. The shrine, with its predominance of white, stands in stark contrast to the mass of red figures below. Begtse and his shrine of skeletons are sometimes seen in thangkas. (3) This superbly carved wooden shrine is the only three- dimensional example known to us. -- T.T.B. 1. Rigpay Lhamo riding on a lion instead of a bear as shown in the appliquÈ of cat. no. 85 is in accordance with the writing of the Panchen Lama Lobsang Paldan Tenpi Nyima; see Tucci, Tibetan Painted Scrolls, vol. 2, pp. 594-96. 2. Nebesky-Wojkowitz, Oracles and Demons of Tibet, p. 92. 3. Fisher, Mystics and Mandalas, cat. no. 28; Copeland, Tankas from the Koelz Collection, fig. 54; and Essen and Thingo, Die G^tter des Himalaya, cat. no. 140.